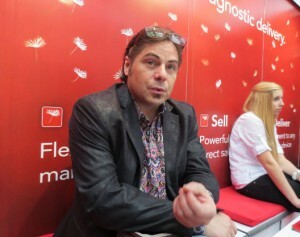 Kevin Franco, Enthrill Co-Founder and President, talks about the company’s progress at its Frankfurt Book Fair booth. Kevin Franco laughs every time he puts it that way, but his Enthrill Distribution system is designed expressly to make ebooks discoverable in brick-and-mortar bookstores and other physical settings. The Canadian firm, based in Calgary, Alberta, has been in development for a couple of years, but only “stepped out of the shadows,” as Franco put it, last May at BookExpo America (BEA). Shortly before the company’s springtime trade-show debut, in fact, it announced a deal to provide Open Road Media in New York with specialty sales and promotional distribution of ebooks. The key? “Device-agnostic” distribution. As you can see in its FAQ for consumers, Enthrill delivers ebooks for all devices and platforms, and provides extensive instructions for side-loading to your device. 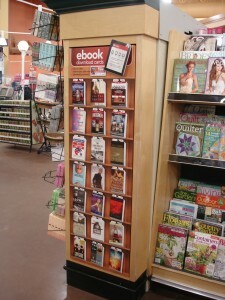 This is the type of retail floor display Enthrill creates for its gift cards in such settings as Walmart. At Enthrill’s booth at the Frankfurt Book Fair, trade visitors saw a model of a store display the company creates for its ebook gift cards. The cards are proxies for ebooks with download codes for gift recipients. This is the in-store discovery aspect Franco talked about. And the company’s biggest news is that its latest retail agreement is with Walmart Canada. Enthrill gift cards will be sold in Walmart locations across the country, allowing customers to walk in, buy a gift card for an ebook, and present it as a gift for the recipient to download to any e-reading device. “About 9% of the downloads on gift cards actually happen on the same day the card is bought, too,” said Franco, indicating that some readers are prompted by a store displays to buy the card and get the ebook for themselves. One of the most interesting parallels to the gift-card way of representing an ebook is Enthrill’s version of this service for authors. 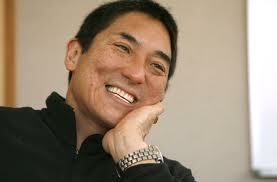 Think of a specially developed “author card” with all the cover art and blurb copy of the original cover. About the size of a mass-market paperback cover, the author card can be signed at a bookstore appearance, lecture, reading, just as a book can, and then handed to a reader. The reader then scratches the back of the card to reveal its redemption code to download the ebook. Significantly, an author or publisher can create and buy author cards without losing any of the sale price of the ebook. Enthrill is paid only for the service and the card printing, taking no percentage of the sale. The Enthrill author card (here one for Guy Kawasaki and Shawn Welch’s book) is printed on both sides and carries a download code the reader uses to get an ebook. 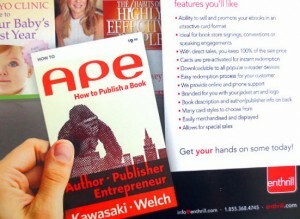 And one of the most visible authors the company has worked with is Guy Kawasaki, who uses Enthrill author cards for the book he co-wrote with Shawn Welch, APE: Author, Publisher, Entrepreneur—How To Publish a Book. Obviously, one of the big draws of author cards is their portability. It beats hauling the usual box of books to a signing. An author who has a relationship with a local bookshop can get an in-store display stand for his author cards, sign them, and have them waiting for potential customers. Having made it possible for publishers to create and order their gift cards for books, Franco said he’s in the process now of creating an authors’ portal to allow authors automated access to the tools to make and order their cards to sell. Enthrill has also introduced a social watermarking program called PackaDRM for its ebooks. It not only carries cordial but pointed messages about appropriate use of copyrighted material, but it also inserts a subtle tracking code into each ebook. Enthrill then reports to publishers any file-sharing misuse of an ebook detected by the system. So how many infractions of proper file usage have been reported, more than a year and thousands of ebooks since the release of PackaDRM in 2012? That’s just the kind of proof of performance Franco likes: quiet. “We don’t send out press releases every time we raise half a million dollars,” he said. “Even the Walmart deal: we’ve been talking with publishers about it, but we’re not sending around press releases,” despite the fact that a retail account that large can be a big boon to Enthrill’s progress.